Microcrystalline cellulose, purified water, enteric coating (purified water, ethylcellulose, medium chain triglycerides, oleic acid, carbohydrate gum [cellulose], glycerin, sodium alginate, stearic acid), croscarmellose sodium, vegetable grade magnesium stearate (lubricant). Contains no artificial colours, preservatives, or sweeteners; no dairy, sugar, wheat, gluten, yeast, soy, egg, fish, shellfish, salt, tree nuts, or GMOs. Sealed for your protection. Do not use if seal is broken. For freshness, store in a cool, dry place. 1–2 tablets 2 or 3 times per day on an empty stomach. Swallow whole (do not chew/crush). Consult a health care practitioner for use beyond 4 weeks. 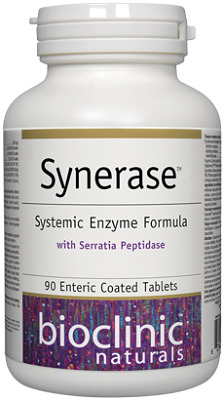 Synerase can also be used for digestive support – take the same dose but with meals or as directed by a health care practitioner. Do not use if you are pregnant or breastfeeding, have gastrointestinal lesions/ulcers, heart or blood vessel problems, high blood pressure, kidney or liver disorder, bleeding disorder, hemorrhoids, are taking anticoagulants/blood thinners, anti-inflammatory agents, or are sensitive to pancreatic enzymes or pork proteins. Consult a health care practitioner if symptoms persist or worsen, if you have persistent swelling, diabetes, pancreatitis, pancreatic exocrine insufficiency or cystic fibrosis, if you are taking other enzyme products or antibiotics, are having surgery, had major trauma, or if you have an allergy to latex or fruits such as avocado, banana, chestnut, passion fruit, fig, melon, mango, kiwi, pineapple, peach and tomato. Hypersensitivity/allergy, dizziness, headaches, difficulty breathing, rash, nausea, vomiting, abdominal pain/epigastric pain and/or heartburn and diarrhea have been known to occur, in which case discontinue use and consult a health care practitioner. Keep out of reach of children.